Instantly rid your skin of dead skin cells and say hi to smoother complexion with the Hi Bye Vita-Peel Clear Pad! Each tub consists of 40 double-sided pads that are non-irritating and extremely easy to use. 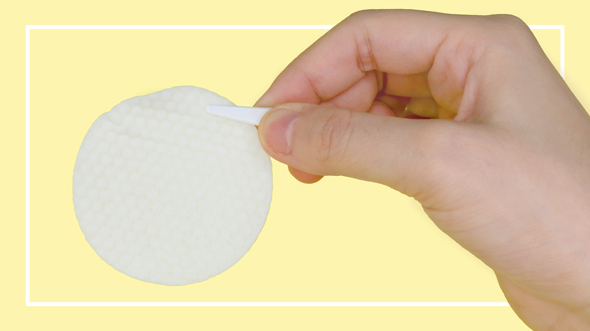 Its microfiber pad can be used to clean your pores while exfoliating the skin while the embossed cotton pad side replenishes moisture, leaving your skin with a healthy glow. These pads can also be used on other parts of the body which needs exfoliating, such as the elbows and knees. The Hi Bye Vita-Peel is a daily vitamin peeling skincare product line meant to exfoliate the skin through 14 types of vitamins and AHA ingredients. AHAs (Alpha Hydroxic Acid) are derived from plant sources and milk. These ingredients chemically but safely breaks down dead skin cells, resulting to smoother and more youthful skin. Just from reading the product description, you might already have an inkling that this sounds like a dupe for COSRX’s One Step Pimple Clear Pads. I hate to admit it, but even the product looks eerily similar. Maybe exfoliation pads can’t really differ much in terms of how they look, but still! Packaging: Nothing much to comment on the packaging for a sample, but I do think the full-size tub looks similar to COSRX’s. Texture: I like that the exfoliation side is not too rough – I know you need a certain degree of roughness to scrub that dirt out, but not to the extent that I hurt my skin too. The other embossed side, which supposedly contains moisture, feels very good to the skin when you rub it gently. Effectiveness: Frankly, I’m not certain that this will give me more youthful skin over a sustained period of time (as per product description), but I’m frankly quite convinced by its exfoliation and hydrating properties even just after using a few samples. You can tell that the pad is doing a good job with the exfoliation when you obviously see the grime and oil, and your skin looks slightly brighter (dirt does dull your complexion quite a fair bit). I like how my skin immediately feels smoother and more moisturized after exfoliation. I was so impressed that I went to try the pads out on my knees and elbows as well, and they worked just as well. Holler to all of you there who are looking for a fast way to clean those areas! I was actually very tempted to post a photograph here of how much dirt the pad managed to absorb but it looks way too gross, so I’ll try not to scare you guys off with it HAHA. I have faced no issues of breakout with this product despite my acne-prone and sensitive skin, so it’s getting a thumbs-up from me in that area. As much as I enjoyed using this (it even smells great tbh), I still do think that I’ll stick with my COSRX ones instead. The COSRX pads are great for keeping my acne in control, which is really my all-time skin concern, while I have not seen any marked improvement in my skin after using this. I would say this is more targeted at people who have no major skin issues, and are just looking for an exfoliator that can provide additional nutritional boosts. In addition, I find this to be a little too pricey for my liking. 40 pads is actually not a lot, if you consider that you exfoliate twice a week. If you exfoliate using 2 pads each time (be it whether you have more area to cover, or that you exfoliate your knees as well), that amounts fo just 10 weeks worth. 10 weeks = less than 3 months, and you’d have to repurchase this around 4 times a year. It also doesn’t really help that banila co is not the most accessible brand in Singapore, and I haven’t found many websites selling this product. However, if you happen to be in Korea (or any other country that is lucky enough to have banila co retail stores), you should give this a shot! Have you tried Neogen exfoliate pads before? Which one is better? Neogen/Banila Co/Cosrx?